With a regime and system rendered illegitimate with a sweeping boycott of sham elections - Thailand must find alternatives to patching itself together beyond the broken ballot box. 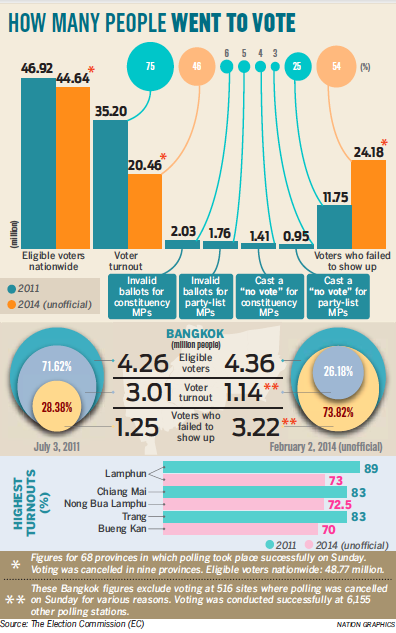 February 5, 2014 (ATN) - Thailand's February 2, 2014 elections produced the worst ever voter turnout in Thai history with a humiliating 46% coming out to cast their ballots. Of this paltry number, many chose to deface their ballots or cast "no vote" in protest of both the process and the regime overseeing it. The elections were carried out with heavy backing from the West, despite the obvious illegitimacy of the process and the nature of the regime. While the West claims it was merely defending the "democratic process," a look into the relationship between dictator Thaksin Shinawatra and the corporate-financier interests of Wall Street and London tell another, more likely story of imposing upon Thailand a proxy regime serving Western, not Thai interests. With over half of all eligible voters choosing to not even vote, and with so many defacing their ballots or choosing the "no vote" option, the ruling regime of Thaksin Shinawatra has clearly lost millions of votes since 2011. It should be noted that turnout percentages are determined based on polling stations uninterrupted by protests - though areas where voting was disrupted are expected to produce results even less favorable for the regime if and when voting occurs. It is clear that the regime has lost the confidence and support of the vast majority of the Thai population and is now without a mandate to rule the country. Furthermore, Thais appear to have lost confidence in the so-called "democratic process" the regime has hijacked in order to create the illusion of a mandate and legitimacy. Despite this, the regime's Western backers continue to promote the myth that merely because "elections" took place, whatever government is formed afterward possesses unquestionable legitimacy. And with this "legitimacy," Thaksin Shinawatra and his political party are attempting to arrest an opposition that clearly commanded the majority of Thai opinion on February 2. The Criminal Court on Wednesday approved the Department of Special Investigation's (DSI) request for arrest warrants for 19 leading members of the People's Democratic Reform Committee (PDRC) for alleged violation of the emergency decree. To compound the regime's authoritarian posture, it should be noted that the emergency decree was announced in response to a terror campaign the regime itself openly carried out against the opposition. It included almost nightly drive-by shootings at rally sites and opposition leaders' homes, as well as brazen broad daylight grenade attacks that left one dead and scores seriously maimed. While the regime and the West will continue framing the elections as a renewed mandate for Thaksin Shinawatra's illegal, illegitimate administration of Thailand, and the opposition as ostentatiously opposing the will of the rural "majority," the reality is that this rural majority joined the opposition on February 2 in boycotting the polls and are literally joining the protesters in Bangkok in response to the regime's collapsed rice-buying scheme. The illusion of Thaksin Shinawatra's popularity has been shattered and the barriers of fear imposed upon the Thai people by his "red shirt" enforcers have crumbled into ruins. With wrecking-ball abandon, his regime has gutted Thailand's rice industry, skewed the economy, shaken confidence both domestically and abroad, and is still awaiting the fallout from other disastrous vote-buying schemes that are in the process of collapsing. However, people need not wait to begin picking up the pieces the regime's corrupt, incompetent ministries have left after their ruinous decade in power. While a new government will inevitably replace the Shinawatra regime, the lessons of the past decade should inform the Thai people that the answers to their solutions lay not at the ballot box, but in their own hands. While Thailand's education system, agricultural industry, banking system, infrastructure, and other essential services provided by the government cannot be easily replaced, they can be augmented by local activism, local institutions, and local collaboration to make up for shortcomings that may or may never be addressed adequately. Protesters who have been meeting and organizing to attend mass rallies, supporting the alternative media in their efforts to counter the regime and its Western backers' propaganda, and volunteering at the rallies themselves can begin expanding their activities toward tangible solutions and enumerated, specific principles of reform. The "fee tablet PC" scam by the government was a bad idea even if it was implemented efficiently. The problem with the Thai education system was never a lack of tablet PCs, but a lack of resources to match qualified teachers and practical curriculum to appropriately sized classes. This can include anything from improving or augmenting local IT infrastructure, to developing cheap and easy-to-replicate technology to assist farmers in both increasing their efficiency and diversifying their economic activity. Local institutions like hackerspaces that combine education, technological research and development, and a venue for meeting and organizing for a wide variety of pragmatic purposes, can also serve as a nexus for disaster response - another area in which the current regime has consistently and tragically failed. An example of a political movement turned pragmatic was Occupy Wall Street, which in the face of Hurricane Sandy, became "Occupy Sandy." It turned its political networks into pragmatic disaster relief networks, and illustrated their political struggle with Wall Street and the proxy regime it controls in Washington, could be outmatched by its pragmatic response to that regime's failure in the face of adversity. The Occupy Sandy movement proved that the US government's failure was not because the odds were insurmountable, but because the government simply did not care. The lesson is that the only people who care about us, are ourselves, our friends and family, and our community. To solve our own problems, we must find the solutions within and among ourselves. Hackerspaces: A space - perhaps a shophouse - with tables for people to gather and collaborate on practical projects such as IT, hardware, robotics, electronics, fabrication, woodworking, etc. Most hackerspaces fund themselves through a combination of monthly dues from memberships and through classes organized to teach skills or discuss concepts. The space is very flexible, and can even be used for local meetings, after-school tutoring, and social events. Farmers' Markets: With the disastrous rice-buying scam collapsed in corruption, scandal, and bankruptcy, farmers across the country are left with empty hands and a wrecked rice industry. Should these farmers possess the skills to produce organic fruits, vegetables, and livestock, and should urbanites both in provincial cities and in the capital create markets for them, an additional source of sustainable revenue can be offered while deeply entrenching a healthier, local agricultural industry across the nation. For example, organic farmers' markets could be created across Bangkok, who independently or cooperatively promote their locations, operating hours, and the farmers they network with. Tours to the farms producing the food can also become a part of the new economy, with new media writing about the health benefits of organic farming versus industrial big-agri. An industry of the people, by the people, for the people is the only true way to achieve real, sustainable, and meaningful "wealth distribution." The technology and resources already exist to make this a reality - a reality already unfolding among dissatisfied Americans seeking an exit out from under the Fortune 500's corporate-financier monopolies. The legal and regulatory barriers these monopolies are using to stem the exodus of consumers into producers do not exist in practice in Thailand.